After the party is over you find a request to fill out an MRC from KO1U in your mailbox. You bring up the log, verify the contacts and check them off on the MRC and sign it. Then you notice that Mark took the time to work you more than 20 times during the party. 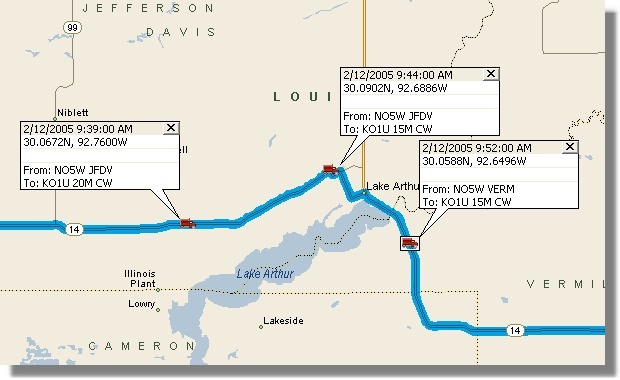 So you decide to enclose 4-5 unique QSLs in the return envelope to KO1U, made possible because by default CQ/X logs the latitude and longitude of each contact to a log separate from the normal QSO log. 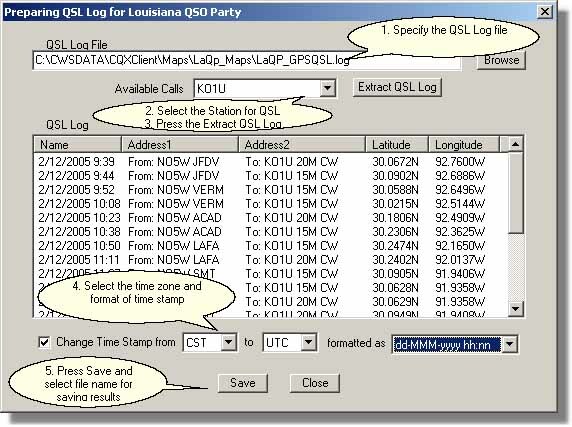 You go into the QP Tools menu and select Prepare QSL Log Files which activates the following dialog on which you've selected KO1U. You follow the indicated steps and Save the results to a file of your choosing. The header at the top of the file is setup to enable importing the data into Streets and Trips (S&T) for a nice appearance in the S&T balloons. You open up S&T and import the resulting file. Then you fiddle with some options in S&T (hmm, let's see, do I want red cars, green cars, or blue cars this time) to get the appearance you want. Then you set a screen capture size (605x365 works well in my environment) in your favorite screen capture utility.You play with the S&T zoom level to get a pleasing display and maybe change the balloon orientations to fit better on your screen capture. When satisfied you capture the 1-4 QSOs on a single card and save the resulting as a jpg file for printing on blank stock -- e.g. 3x5 index cards or blank QSL stock if you've got some. You repeat the screen capture and printing process for the remainder of the KO1U QSOs. Some examples are shown on the QSL Gallery page.